At Apogee, we invest in helping you reach your goals. Our Empower Platform gives utilities the tools you need to engage the modern consumer with personalized, outbound and proactive energy messaging that delivers higher satisfaction and measurable results. 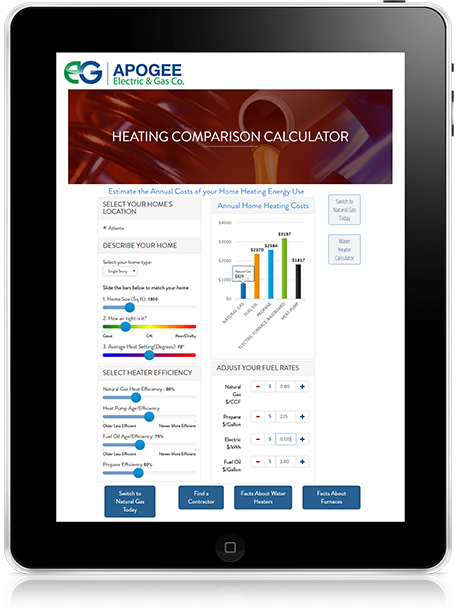 Enhance your Natural Gas Conversion campaign with energy calculators that help your customers make informed decisions about energy choices. Apogee’s energy calculators will help your customers predict and decide, moving them closer to the decision to convert to natural gas. Let customers explore the benefits of natural gas while using customized tools that who accurate savings and cost comparison. Once you have engaged the customer, drive them to the next step by helping them through the processs. “Contrast the annual costs of water heating in your household through a heat pump, natural gas, electric, propane, or fuel oil. Estimate the annual cost to run your clothes dryer, powered by natural gas, electricity, or propane. Compare your annual cost of energy for cooking, using natural gas, electricity, or propane. Inputting your home’s location, size, insulation level, and typical thermostat heat setting, find out how annual heating costs differ using natural gas, heat pump, propane, or fuel oil.